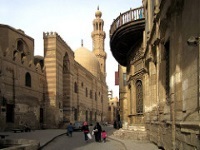 Once known as the Roman stronghold of Babylon, Coptic Cairo is the oldest part of the city and the heart of the Coptic Christian community. Home to 5 original churches alongside Egypts first mosque and oldest synagogue, these ancient walls house three of the major religions of the modern world in one special area. It is a peaceful place to wander around and a respite from the busy city centre. Churches of interest are the Al-Muallaqa (Hanging Church), the oldest Christian place of worship in the city, and St Sergius where the Holy Family reputedly sheltered during their flight to Egypt. You can take the metro into Coptic Cairo from Tahrir Square. It is useful to have a guide when exploring the area as there is so much history to discover and so much to see. However, visitors who chose to explore alone will feel the power and age of the place and should still be able to find all the major attractions.